Although unfinished the Moor Shore Road living shoreline is already at work. Waves strike the sills, calming the waters behind them. After almost two years of getting the permits and making sure funding was in place, at long last a living shoreline project is moving forward along Moor Shore Road in Kitty Hawk. Moor Shore Road is sort of a forgotten street, a short strip of pavement that off Kitty Hawk Road that runs past some of the oldest properties in Kitty Hawk, parallels the bay for short but beautiful time before intersecting with Beacon Drive and ending. At one time, though, it was an important road. Clearly seen on USGS maps dating back more than 100 years, it is the way the Wright Brothers got from Bill Tate’s Kitty Hawk home to their Kill Devil Hills camp. Although largely forgotten, it is still an important road. When traffic or weather closes US158, the Bypass around the Kitty Hawk Post Office, it is the emergency route for traffic. It’s also one of the legs of the Outer Banks Marathon. Increasingly over the past five or six years, the road floods during strong, sustained southwest winds. The reason is apparent—the beach and marsh that once protected the road have disappeared. 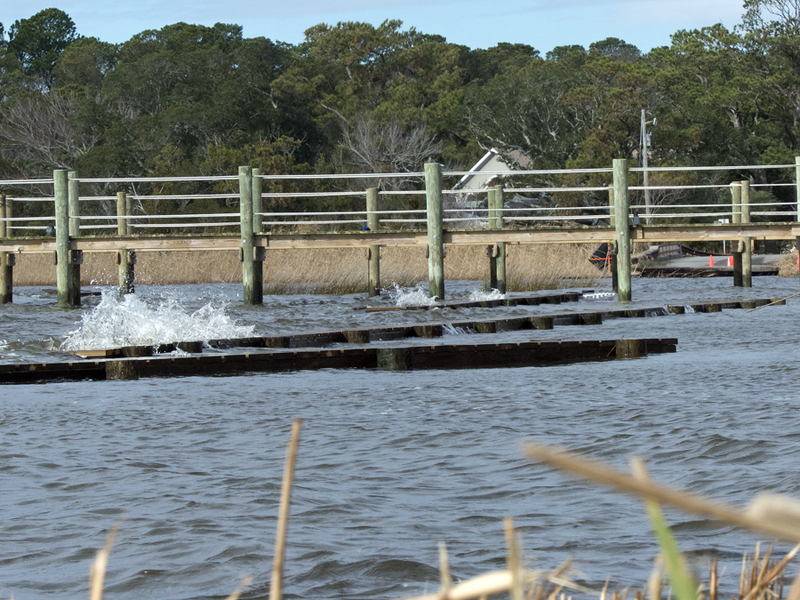 About two years ago, the North Carolina Coastal Federation, at the request of Kitty Hawk citizens, began looking into whether a living shoreline would be effective in protecting the road. Apparently, yes it will and with multi-multi-agency funding the project is now underway. The primary sound of funds for the project was a NOAA grant. The Town of Kitty Hawk has also guaranteed over $150,000, although those funds will only be spent if there is a shortfall. Perhaps most significantly NCDOT is also part of the project. According to a spokesperson for the NCDOT, this is the first time the agency has used a living shoreline as a means of protecting a road, and much of the delay in moving the project forward was allowing the state agency time to cross all their “Ts” and dot all their “Is” in figuring out how to include in their arsenal of shoreline protection. Living shorelines have become the preferred method of shoreline protecting. Using sills that are offset from one another, the energy of waves as they come ashore are dissipated. The waters behind the sills are calmer, allowing native seagrass and reeds to regrow, offering further shoreline protection. The first phase is almost complete with of the sills in place. Phase two will have volunteers planting grasses on the shoreside of the sills this spring. There is always something happening on the Outer Banks. Plan your stay with Joe Lamb, Jr. & Associates and discover how wonderful life can be.